Caldecote A v Cranfield Utd Res. Picture: David Kay. Jamie Warne and Jack Downes with braces were joined on the Blue Cross scoresheet by Liam Trainer to bring up the home nap hand against a lone Town reply from Phil Matthews. Now in second spot are last seaso’ns champions AFC Oakley M&DH who ran out 3-1 home winners over Ickwell & Old Warden thanks to goals from Matt Barnes, Harrod Wood and Nathan Aulsberry. Whilst third spot is now occupied by AFC Kempston Town & Bedford College who won 4-3 at Stevington. Mike Stephenson with a brace joined on the College scoresheet by Courtney Boughton and Daniel Green against home replies via an own goal plus James Bourke and Joe Holyoak. Having started the day in second spot Renhold United now find themselves sitting fourth after their nine game unbeaten home run was ended by Marston Shelton Rovers who in winning 2-1 were ending a three game losing run in style. Harry Baker and Wes Burrows netting the Rovers goals against a lone United reply from Alex Liburd. For Shefford Town & Campton it was a move upwards in the league table to sixth place after they retained their seasons unbeaten home ways with a 2-1 win over Wilstead. Ryan Lewis scored both goals against a lone reply from Kevin Butler. Whilst Sharnbrook’s three game winning home run was brought to a close after they were held to a 2-2 draw by bottom of the table Sandy. Martin Bennett netting a brace for the home side and Matt Johnson doing likewise for the visitors. Elsewhere it was joy on the road for Cranfield United who won 5-3 at Kempston Rovers Development. Martin Holland leading the way with a hat-trick and joined on the scoresheet by Liam Whitmee-Craig and Rob Lindsay to bring up the nap hand against Rovers replies via Patrick Asare, Sam Smith and Kye Andrews. The scheduled Ampthill Town Reserves v Caldecote game being postponed due to a frozen pitch. 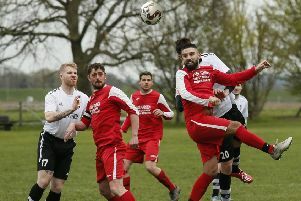 Queens Park Crescents’ lead at the head of Division One is now one of nine points after they took their unbeaten ways up to six games with a 3-1 home victory over The 61 FC Luton Reserves. Fabio Sattar, Shahinur Rahman and Daniel Rasol netting the vital goals against one in reply via 61’s Van Den Berg. With Crawley Green Reserves having to call off their home encounter with Totternhoe Reserves due to a frozen pitch they now drop to third place in the standings to be overtaken by M&DH Clapham Sports after they share the spoils in a 3-3 home draw against Westoning. Ryan Prior, Marko Tobzic and Sam Maddix scored for the home side against visiting responses via an own goal and a Rob Cooksley brace. Over at Miller Road, Meltis Albion moved themselves back into the top six by ending their six game losing run with a dramatic 5-4 home win over Old Bradwell United Reserves. It was United who were to strike first via Adam Mills after just two minutes and held that lead until first Tom Hughes drew the Albion level in the 18th minute and Daniel Taylor headed them in front just six minutes later. However, United were to level in the 44th minute via Peter Maddgen to send the sides in at 2-2 for the half-time break. Within five minutes of the restart Lewis Gray from the penalty spot had shot the visitors back in front for the second time in the game only to see Scott Alleyne make it 3-3 just seven minutes later. United despite their lowly league position then regained the lead for the third time in the 65th minute with the goal of the game from Sam Cherry and now looked on their way to victory until first Gary Townsend evened matters up in the 86th minute before Craig Damon netted the Albion winner in the 90th minute. The drama was completed four minutes later when United goalkeeper Lawrence Nuamah saved a spot kick to prevent Scott Alleyne netting his second goal of the day. Elsewhere, AFC Kempston Town & Bedford College Reserves took their winning ways up to three games with a 5-2 victory at Cople & Bedford SA. Aaron Chaplin leading the way with a hat-trick and joined on the scoresheet by a successful penalty from Dan Church and a strike from Anas Bechkoum against home replies from Brett Allen and Lewis Fox. The Groveside local derby between Henlow and Shefford Town & Campton Reserves was frozen off. The lone scheduled game between Lea Sports PSG and AFC Oakley M&DH Reserves was frozen off. For Dinamo Flitwick it was an end to their five game losing run with a 2-0 victory at Sandy Reserves to climb back into third spot in the league standings, Josh Pearson and Alex Summers netting the goals. Whilst Flitwick Town A claimed just their second home league win of the season in beating Stevington Reserves 6-0. Stuart Kemp with a hat-trick joined on the scoresheet by a brace from David Lyons and a single strike from Kevin Higby. Potton Town ensured their name will go into the hat for the last 16 draw with a 3-1 home win over AFC Kempston Town & Bedford College A. Paul Mijalski with a brace plus Joe Stevens netting for the home side against a lone reply via Jesse Sidhu. Riseley Sports now know they will top group B after winning 3-2 at Atletico Europa. Jake Hislop, Sam Harrison and Adam Poole on their scoresheet against home replies via Paddy Alimanji and Marcello Invinell and Clifton likewise know they will finish bottom of the group after losing 3-2 at Bedford Albion. Stephen Mabberbley, Jack Brown and Paul Babbington netting for the Albion against visitors replies via Dylan Donaldson and Adam Drakulic. The clash between the group’s top two was to end in a 2-2 between CS Rovers and Caldecote Reserves. Connor Darocha and Joe Lydon on the Rovers scoresheet against replies via Carl Heath and Josh Wilson. Caldecote A’s quest for a last 16 place was to suffer a setback after they were held to a 2-2 home draw by Cranfield United Reserves. James Whitmore and Chris Foster were on their scoresheet against United replies via Ryan Collis and Jonny Lam. With Group winners Flitwick Town Reserves winning 2-1 at Marston Shelton Rovers Reserves the hosts now need to win their last group game to stand any chance of making the last 16.Jim Lewis and Jason Strong netting the Town goals against a lone reply from Andy Elms. Whilst Harlington kept their last 16 hopes alive with a 13-0 victory at White Eagles. Shea Gentle-King, Abdul Sidkar, Liam John and Farrell Whitman all netting braces and joined on the scoresheet by an own goal plus strikes from Cameron Fazel, Lesile Medford, Chris Rowe, and Ryan Martin. Houghton Athletic did their chances of making the last 16 a power of good with a 4-2 victory at group leaders Wilstead Reserves. Sam Martin with a brace joined on the scoresheet by Jordan Thomas and Benn Hayward against home replies via Hani Thiarra and Lewis Duffield. Sandy Albion kept their last 16 hopes alive with a 4-1 home victory over group leaders Sundon Park Rovers. Liam Brophy, David Smith, Jack Willis plus a Jonnie Stratford penalty doing the damage against a lone Rovers reply via Shane Roberts. The scheduled Wootton Village v Henlow Reserves game being frozen off. Lidlington United Sports were to claim their first group win of the series in winning 3-2 at Shefford Town & Campton A. Paul Oldfield, Gareth Llewelyn and Jay Peachey on their scoresheet against Town replies via a brace from Liam Radley.